Of all the fun things we do, the "Mix & Mingle" series is one of our absolute favorites! We love getting to share with you a little more behind the scenes look at some of the faces or products you see on our blog. 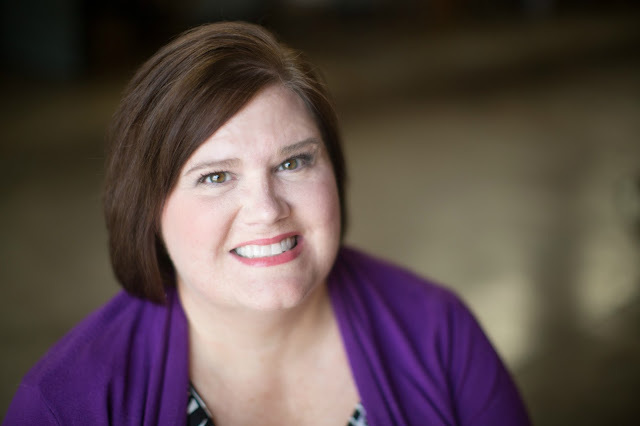 We've met and become friends with some amazing Mom Bosses through our little slice of internet, and at the top of our list is our friend Kathryn. Kathryn is the owner of Feathered Nest Boutique, which features her amazing Southern Girls Collection. She is located just a hop, skip, and a jump away from our hometowns, and we've put "Take Kathryn out for drinks!" at the top of our must-do list for this year. We just know it would be a good time! I grew up in Fort Valley, Georgia on my family's farm and have called Athens home for the last 20 years. My two kids, Emerson, 17, and Parker, 15, and our five rescue dogs keep me on my toes and make life anything but boring. 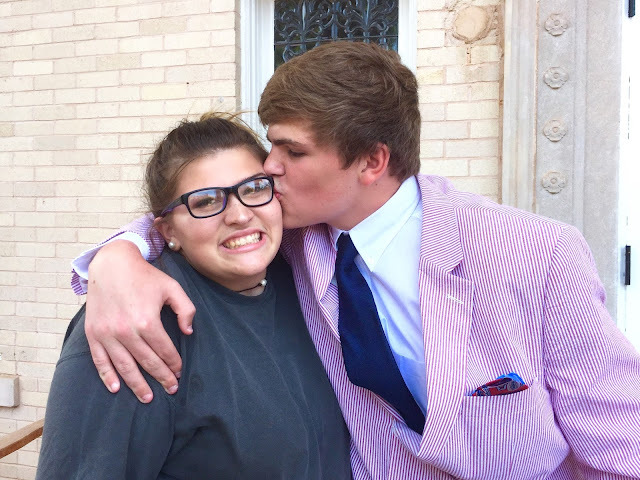 I'm NOT ready for my daughter to be graduating soon from high school. EEK! IF YOU COULD VISIT ANYWHERE IN THE WORLD, WHERE WOULD THAT BE? My happy place is St. Simons Island. I spent vacations there as a kid and with my children as well. I cannot think of anything better than sand, salt air, and Bennie's Red Barn or Barbara Jean's! WHEN YOU HAVE 30 MINUTES OF FREE TIME, HOW DO YOU SPEND THAT TIME? I love to read! A few of my favorite Southern authors are Karin Slaughter, Anne Siddons and Charles Martin. 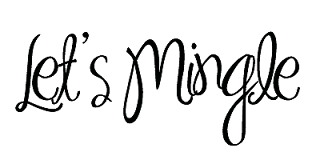 HOW DID FEATHERED NEST BOUTIQUE COME TO BE? I started Feathered Nest Boutique six years ago after losing both my parents and going through a very rough time. I've battled depression more than half my life but after my parents passed away, I struggled with severe depression, anxiety and panic attacks. FNB was a way for me to focus on creating something positive, having a purpose each day and a way to force myself to interact with people again. I started making purses but soon fell into a passion for monogrammed items. My dream was to have a brick & motar store but I felt that wasn't obtainable with my anxiety. So I found another option with my online biz. I still prefer to 'hide' behind my screen most of the time but my social-media presence allows me to do more whenever it feels right. Baby steps! My work space grew from my mother's sewing machine crammed into a tiny closet to a porch-turned-sunroom-turned-studio. It's tiny and overflowing but it's a dream come true! Growing up I was surrounded by strong, creative Southern women who taught me to sew, work hard, and never give up. Whenever I hit a wall creatively or business wise, I think about them and how they would attack it. My mother was an amazing artist who, in the 1980s, had her own counted cross stitch business. I grew up watching and helping her in her office, warehouse and even at national trade shows. She taught me to strive to always provide the customer with more than they expect. 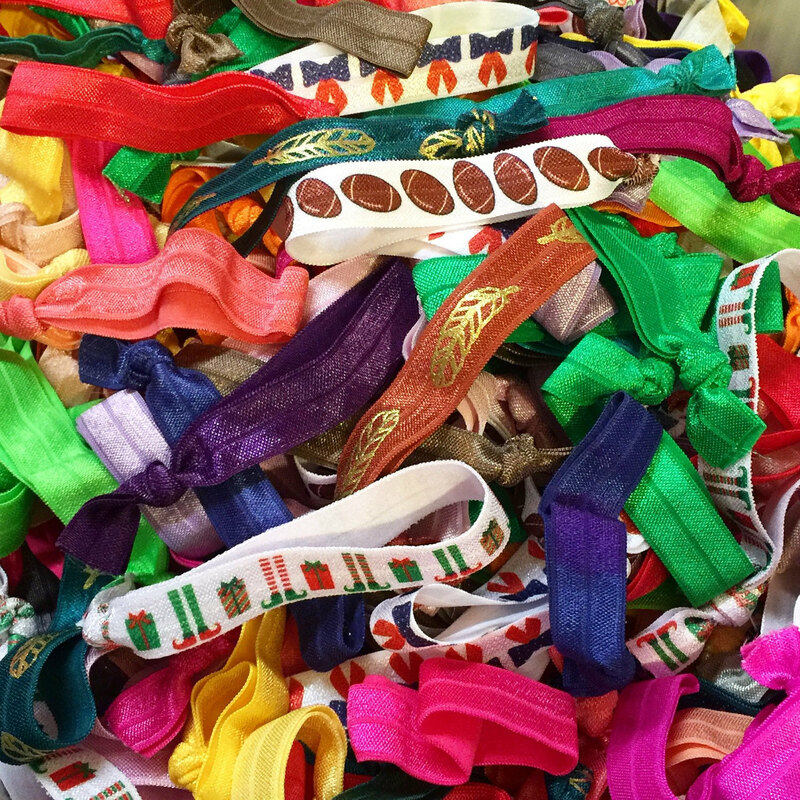 That's why I include my handmade hair ties with every order - my little way of saying thank you! My daddy was a third-generation farmer who gave me my love of all things Southern. 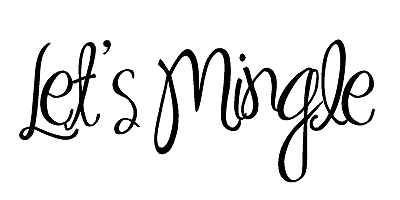 I'm actually in the process of rebranding my business and changing the name to honor my daddy and our family's farm. In the studio, every day I use my Grandmother's sewing table and my Mama's sewing tools.The mantel in the studio belonged to my other Grandmother. A recycled gate turned bulletin board is covered with photos of my parents and my kids as daily inspiration. Isn't her work space just darling?! And we love all of her southern and family ties that continue to inspire and influence all that she does with her business. Now that y'all have gotten to know a little more about Kathryn, we want to share some of her AMAZING products that we just love. When we say this gal knocks it out of the park, we mean it. She makes so many adorable things and puts a southern twist on just about everything she creates. For special occasions or everyday fun, she's always able to deliver a little something perfect for our needs. No matter what the season or what the holiday, Feathered Nest Boutique has the cutest tops ready to help you be decked out in theme wear. There are lots of monogram options or super cute sayings! These are some of our favorites because they are so comfy, but so cute! This Pucker Up Buttercup design is cute for Valentine's Day, but also date nights! And you might remember this that we shared on Instagram before New Years? The off the shoulder sweatshirts look great layered. This "Bless Your Heart" sweatshirt is one of our new favorites, and has been on repeat lately! Our Southern souls just needed this in our closets. There's not a day that goes by that this saying - or at least thought - doesn't eek from a southern ladies lips somewhere. We love that the saying comes in a fun array of other options too (see the Raglan tee, and the Comfort Colors Long Sleeve Tee)! 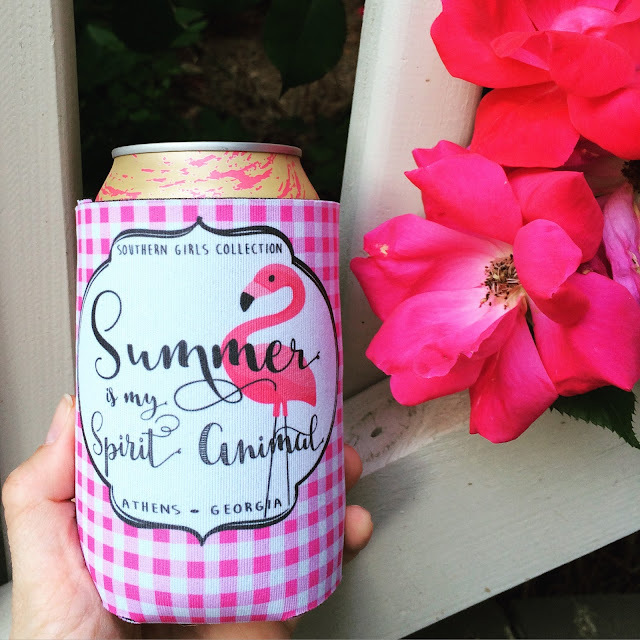 If there is one thing we love in the south it is nice cold drinks and therefore, we always have can huggers (or koozies, as I've always called them) on hand. There is nothing worse that having your drink get warm before you finish drinking it. 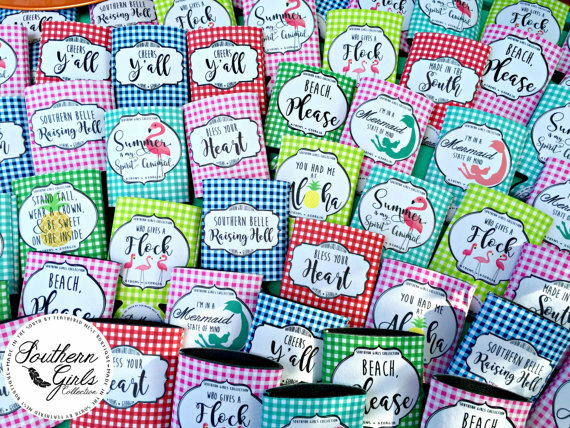 Kathryn has such adorable gingham koozies with the most fun sayings on them as part of her Southern Girls Collection. Some are really fun for holidays and events and we just love the tongue-in-cheek-ones she comes up with best! Stay tuned too because we got some inside information from Kathryn that a few new additions will be made to the collection soon! Listen what girl doesn't love a good tote? Especially a cute one? Well remember, that adorable "Bless Your Heart" Sweatshirt we mentioned above? It also is available in a tote! And how cute is it?!? These totes are large, in charge, and perfect for your everyday needs. It comes in a few different colors, and a variety of options for color of the wording. We love the variety available and think it would make for a great gift! We mentioned that she offers tons of monogram options, but did you know she often combines two of our favorite things?!? Monograms and Lilly!!! From sweatshirts to appliquéd fleeces to beyond adorable ball caps - she's covered it all! And one thing that alway stands out to us are the little things. With every order she includes hand tied hair ties and often a little candy or treat as a way to say thank you for ordering from her shop. Those little things make us smile and it is as if she's sending a bit of southern hospitality right along with your order. 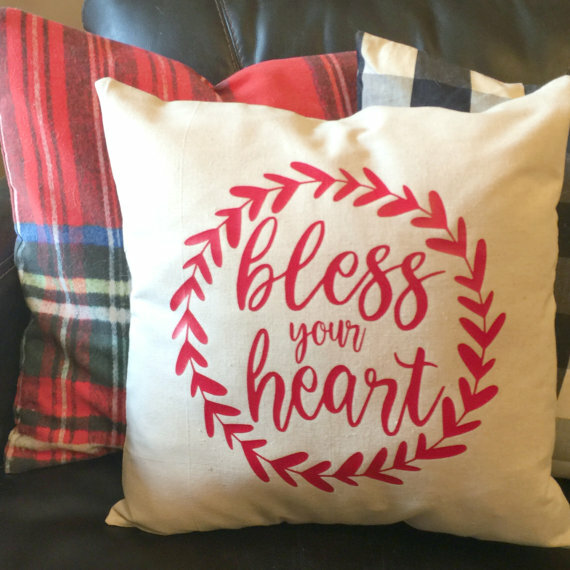 We're so excited to be partnering with Feathered Nest Boutique to give away this Bless Your Heart pillow cover and can huggers to one lucky reader! To enter, simply leave a comment letting us know something you saw in her shop that you loved! Winner will be announced on Valentine's Day! After seeing Jen with the "Bless your heart" sweater, I totally thought I needed it! And now I remember needing it again :) Add to cart immediately! To be honest, I could order oneof everything - such cute stuff! Thanks for featuring such fun brands! Love the youth Lilly monogram zip ups for my girls! Plus I have a friend getting married and I can't wait to show her the gingham monogram shirts for her bridesmaids! Adorable shop! All of it is so cute! I love the koozies and the shirts. I also saw a super cute baseball visor. As both the boys are playing this year I'm having to embrace boy things while still being such a girly girl. 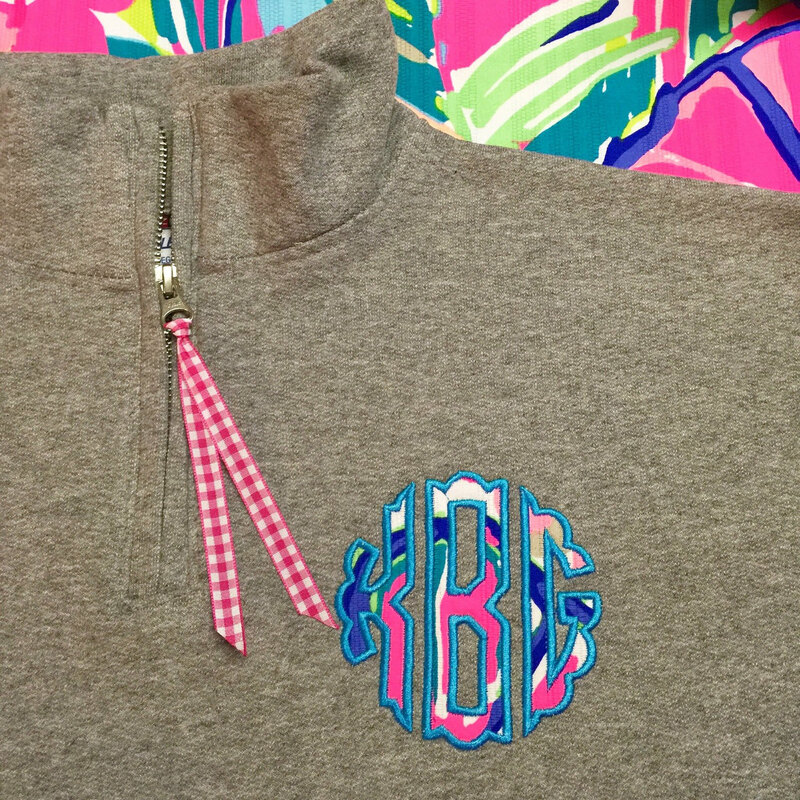 I LOVE the Lilly Circle Monogram 1/4 zip sweatshirt in gray! But there are so many cute things!! Such a great shop! Makes this NJ girl miss her Clemson days so very much! Love the Living a Blessed Life raglan shirt. I also need to pick up a St Patrick's day shirt ASAP! I love Feathered Nest & all her cutesies! I call her Keith because we're hometown friends, she is the best at what she does & her customer service & Southern hospitality is the best ever! Mascot baseball cap and the Pucker Up Buttercup tee! I run on coffee, sarcasm, and lipstick. Hahahahaha what a perfect shirt for me and my girlfriends. I love the monogrammed gingham boyfriend shirt. Congrats!!! You are our winner!!! Please email us at themagnoliamamas@gmail.com to claim your prize! Yay!! !I just emailed you. Thank you! Absolutely love this Etsy shop. Have ordered 2 Ragland so far and I loved the personal touches as well! I already see ao many things to add to my wish list....including this pillow!! Love!!! Although I love most everything in the shop one of my favorites is the Inspire, Teach, Love tee because I work with children everyday. You are all so creative and inspiring! I loved absolutely everything but I fell in love with the "Bless your heart", sweatshirt ! Simply gorgeous a must have right now 😊 Thank you for the opportunity. Love her I live on coffee, sarcasm and lipstick Raglans. So cute! I am loving the half-zip lily monogram pullovers! I am a suckers monograms! !